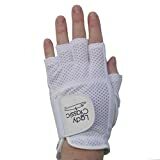 This Ladies Half Golf Glove provides fashionable protection and grip without letting your fingernails and ring damage your glove. The soft leather palm enhances your grip, while the double reinforced elastic closure and breathable mesh backing maintains ventilation and comfort. The glove also comes with a ball marker for your convenience.